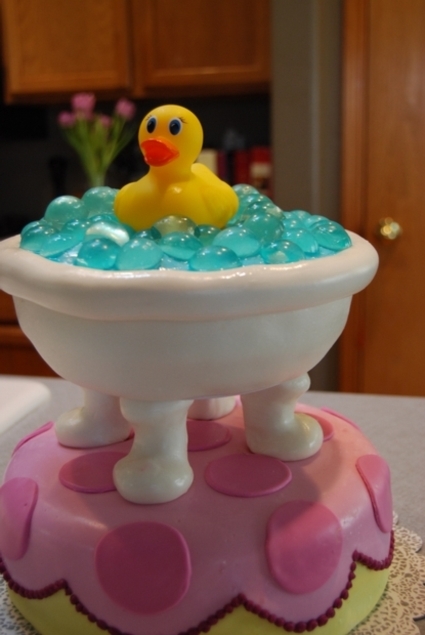 We originally discussed making the whole cake in the shape of a duck, but I thought it might look more interesting if a duck was featured swimming in a tub on top of a cake. The cake itself is very simple – two round cakes separated with pillars that were covered in fondant to look like the tub feet. The top cake was trimmed to round the bottom. 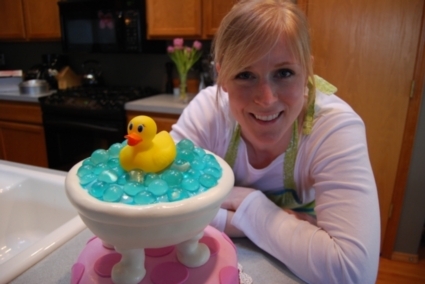 The bubbles on top of the cake were made in lollipop molds to form half-circles out of gelatin and blue food coloring. They ended up looking very water-like. One of my passions in decorating cakes is to keep the cake central to my themes. We’ve all seen that you can built, sculpt, and mold edible substances into nearly any shape, but I think the challenge is making good old-fashioned cake look amazing!